For the gals who want to ride like Nicola Butler, CWB's Sapphire Wakeboard offers everything you need to rip as hard as anyone out on the water. Designed with adjustability and performance, the Sapphire is one of CWB's high-end women's boards. This board features a customizable design for versatility and the four adjustable glass filled nylon fins for a loose or tighter feel. For the gals who want to ride like Nicola Butler, CWB&apos;s Sapphire Wakeboard offers everything you need to rip as hard as anyone out on the water. Designed with adjustability and performance, the Sapphire is one of CWB&apos;s high-end women&apos;s boards. This board features a customizable design for versatility and the four adjustable glass filled nylon fins for a loose or tighter feel. The Sapphire is a great board for all you ladies looking to go big. 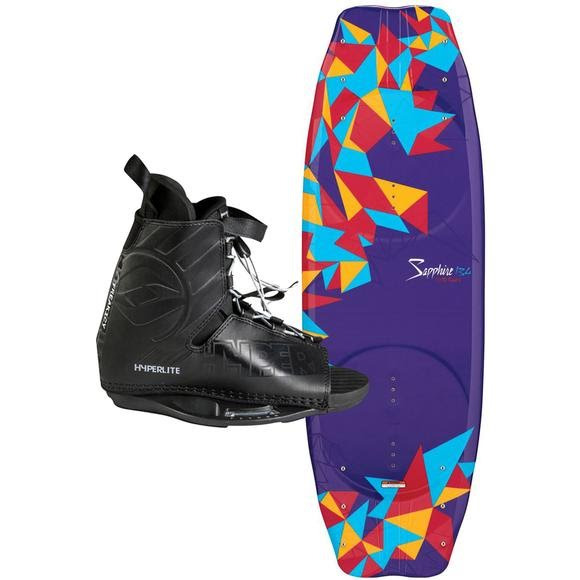 Women&apos;s Hyperlite Frequency bindings included. Blends the abrupt bigger pop of a 3-Stage rocker with the smoother predictability of a continuous.